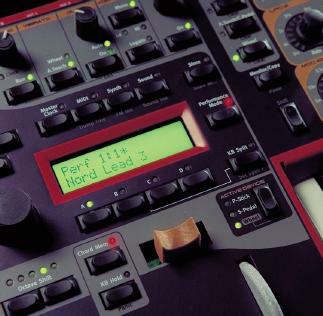 Nord Lead 3 OS V1.04 and new Factory Sound LibraryThe Nord Lead 3 OS V1.04 is the first official software upgrade for the Nord Lead 3 Performance Synthesizer. The software designers at Clavia have pent the last couple of months since the initial release of the Nord Lead 3 with improving and fine-adjusting its sound and functionality. One of the most significant changes if you have V0.96 or earlier in your synth, is the increased polyphony to 24 notes. The filter section has been improved to behave more like an analog filter. Along with the V1.04 OS comes the new and expanded factory sound library, now consisting of seven program banks with up to 128 programs each. Some banks are categorized to make it easier to find the sounds you're looking for. The new OS and factory sound library are free of charge when downloaded from Clavia's website.